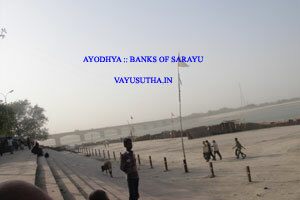 Ayodhya is situated on the banks of river Sarayu. It is known as Kaushala Desa and is an ancient city. It is of religious importance to all followers of Sanadhana Dharma. Ayodhya is described by scriptures like Garuda Purana, as one of the seven moksha puris [meaning – the holy place for obtaining liberation]. Ramayana describes the city as the one which was fortified with watch towers, surrounded with gates and moat. It will be of interest to know that the city had long and broad roads which were cleaned daily. The city had been in existence even before Ramayana period but to us now the descriptions found in Ramayana itself is old. Experts are of the opinion that the present city is much smaller than the one described in the epic Ramayana by Sri Valmiki. The place has undergone many highs and lows in its history. Vamsha Varnanam is one of the important ingredient of a Purana. Surya [Sun] is the son of Kashyapa son of Marichi the manasa puthran of Brahma.Later in the same dynasty many famous rulers were born – to name a few, Mandhathu, Ambareesha,Sathyavratha, Thrisankhu, Harischandra, Dileepa, Bhageeratha, Ikshvaku, Katwanga, Raghu, Dasaratha,Rama. Ikshvaku and his sons ruled Bharat with Ayodhya as capital. Thus this holy place had been the capital of the Dynasty known as Surya Vamsham. Bhagiratha [by his penance he brought the celestial river Ganga to Earth]. The best among them was the son of Dasharatha - Sri Rama, who was reincarnation of Lord Vishnu Himself. Atharva Veda states that Ayodhya was a city built by Gods and the city was as prosperous as paradise itself. This holy place is where Sri Rama, son of Dasharatha, was born and brought up. Valmiki Ramayana gives a full description of this city. Today like any other ancient place this city also had changed and on the first look of it, may appear to have lost all the charm that was prevalent during Ramraj. But, if one examines closely the important places of the city it will be evident that it is not really so. All that one had to do is not to visit this holy city as a tourist for a day, but go as a pilgrim for a stay of few days seeing all the places of significance when one will know the difference. The city is vibrant even today with religious fervour. Honesty and contentment in life – two vital aspects of one’s life – virtually absent in modern cities, are strikingly present even today in most parts of Ayodhya. With the goodness abundant, one will come out as a person changed for good when he walks out of this holy city. According to the epic Ramayana, the city of Ayodhya was founded by Manu, the progenitor of all mankind. In the time of Chakravarthi Dasarath, father of Rama, it was fortified with towers and gates, and surrounded by deep moats. The present city of Ayodhya, is virtually confined to the north-east corner of the old city. It is just two miles in length by about three quarters of a mile in breadth; at one time not even half of this extent was occupied by building, and the whole place waswearing a look of decay. There are no high mounds of ruins, covered with broken statues and sculptured pillars, which generally mark the sites of similar ancient cities when they decay. There were only low irregular mass of rubbish heaps, from which all the bricks have been removed for constructing the houses in the neighboring city of Faizabad. This city -which is two miles and a-half in length, by one mile in breadth - was built chiefly with materials salvaged from the ruins of Ayodhya. The two cities together occupy an area of nearly six square miles, or just about one-half of the probable size of the ancient Capital ruled by Sri Rama. In Faizabad, the only building of any importance then was the one in which the famous trial of Warren Hastings was held. Faizabad was the capital of the first Nawabs of Oudh, but it was deserted by Asaf-ud-daolah in A.D. 1775. Present day Kanaka Bhawan was the residence of Sri Rama. During the days of Sri Rama rajya, Sri Sita Mata use to receive athitis at their bhavan and see all comforts are provided to them.. It was customary for Sri Sita Mata to provide food, for all those who visited them from far off place, under her personnel supervision. The langar – popularly known as Sita Rasoi - was in operation through day and night. Nobody has to return without food-on empty stomach. During this kaliyuga, this practice of providing langar for all those who visit Ayodhya was reinvented and put to practice by the Saint Sri Sri ManiRamdas ji. Sri Maniramdas ji was disciple of Sri Sri Hanuman Das ji who in turn was disciple of Sri Sri Ram Prasadcharya. As instructed by his guru Sri Mani Ram Das undertook twelve years of meditation in Chitrakoot kshetra. He was given marga dharshan by none other than Lord Sri Hanuman himself to proceed to Ayodhya to reestablish ‘Sita Mata ki rasoi”. Accordingly he came to Ayodhya and used to collect money in the banks of Sarayu River from the generous people to make rotis for Sadhus who were visiting Ayodhya. In few days he established a chavni and served the Sadhus with food. He also setup a Goshala. The congregation of Sadhus use to recite Ramayana of Tulsidas as well as Valmiki. The Mani Ram Das chavni established by Sri Mani Rama Dasji around three hundred years back is now the epicenter for many religious activity. This complex has “Char dham” where replica of the deities of all the four [char] dhams [Sri Badrinath, Sri Jagananth Dham, Sri Dwaraka Dham, and Sri Rameshvar Dham] have been installed. Adjusant to this is the main Sri Mani Ram Das Ashram. The Ashram has a temple for Sri Ranganatha. There is a pillar on which all the slokas of Sri Bhagavat Gita have been inscribed. The main attraction , however , is “Sri Sita Mata ki Rasoi” which is providing food for the saints who are staying in the ashram and are engaged in nothing ther than reciting/reading Srimad Ramayanam. Just opposite to this ashram is the huge “Valmiki Bhavan” where entire twenty four thousand verses of Srimath Valmiki Ramayana are engraved in marble slabs. There is Sri Ram Durbar in the middle of the Bhavan. In the bhavan there are vaults containing books where several crores of ‘Sri Ram’ nam have been written. They provide note books where the devotee can write ‘Sri Ram” nam and submit to them. All the twenty four hours of the day Sri Rama Sankirthan is performed in this holy place. "Maharshi Valmiki Research Library" has more than 1000 Pandulipiyan and 30,000 religious & historical books. There is an International Research center for Sanskrit, Vaidhyasala for natural therapy and yoga therapy. The chavni is under the supervision of Mahant Nritya Goplal Das Ji at present. He is the 6th Pithadhishwar of "Sri Maniram Das chavni". Before him Sri Maniram Das ji maharaj, Sri Vaishnav Das ji maharaj, Sri Ram Charan Das ji maharaj, Sri Ramshobha Das ji maharaj and Sri Rammanohar Das ji maharaj ji were the main heads of the chavni. As mentioned earlier, Mahant Sri Mani Ram Das ji had come to Ayodhya as per the guidance of Lord Sri Hanuman and established “Sri Sita ma ki Rasoi” and the other appendages, described above. In reverence to Lord Hanumanji he established a temple for him in the middle of a sarovar called “Bindu Sarovar”. The Temple is Hexagonal in shape built on the elevated pillars in the middle of the Bindu sarovar. The tank which is square in shape has steps on the sides so that the devotees can take bath in the water which is under the lotus feet of the Lord Sri Hanuman. The gigantic deity of Lord Sri Hanuman is a feast to the eyes of the devotees. The deity is seen in the standing posture and is about fifteen feet in height. Lord is seen looking straight and his left hand is holding a ‘gadha’ which is resting on his left shoulder. His right hand shows the ‘Abhaya’ mudra - assuring that He will protect those who come to serve Sri Rama. His head is adorned by a crown. His eyes are so set, that from whichever angle a devotee looks at Him it appears as if the Lord is looking at him directly. After having a dharshan of Bade Hanuman of Ayodhya one feels that he has nothing to worry about in the life, since he gets the assurance that He will protect his devotees and Sri Ram’s devotees.